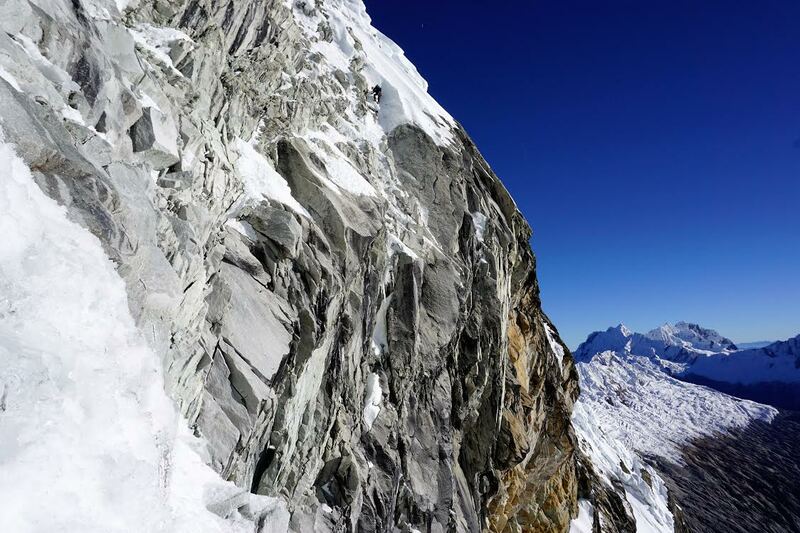 Canadian climbers Alik Berg and Quentin Lindfield Roberts completed a new route on the east face of Chacraraju Este (6001m) in Peru in mid-July. The Devil's Reach Around (M6 5.10, 90�) is the first route on the face to be completed without aid, and the two men did it in just two days, with part of that time spent waiting out the hot midday temperatures. This is also only the second route to breach the headwall, as opposed to joining one of the ridges near the top (The Shriek of Black Stone, rated 5.10 A2, put up by a Slovenian team in alpine style over six days in 1999, was the first). "We summited at sunset on the second day and had a chilly night on the summit," Berg said in an email. "Normally I would have been antsy to get off the mountain and wouldn't have been keen to bivy at such an exposed spot, but with the perfect weather it seemed totally reasonable!" The peak has a reputation for difficult snow conditions that have forced many aspirants to bail early on or turn around before reaching the true summit. Reports in the American Alpine Journal include stories of close calls with falling rocks and cornices. "Generally the snow conditions were very good in Peru this year," Roberts said in an email. "The mountains seemed very quiet (although neither of us can compare to previous years). Maybe the extremely dry year last year cleaned up a lot of the long-term instabilities." The temperatures fluctuate dramatically down there. We managed to climb through all of the snow to the headwall in one overnight push. That meant that we weren't as exposed when the mountain was hot. We climbed the rock pitches in the sun and waited for the shade to climb ice. That seemed to be an effective tactic to stay safe. It just means that you have to be in the right place at the right time of day. Things did seem to fall apart when the face warmed up. We had to hunker down in protected places for hours at a time. That wasn't really an issue though, because things did lock down when it got cold and we welcomed a rest and re-hydration break. It sure helps to be used to climbing in the Canadian Rockies—I think those mountains are more scary when compared to other ranges than we realize. 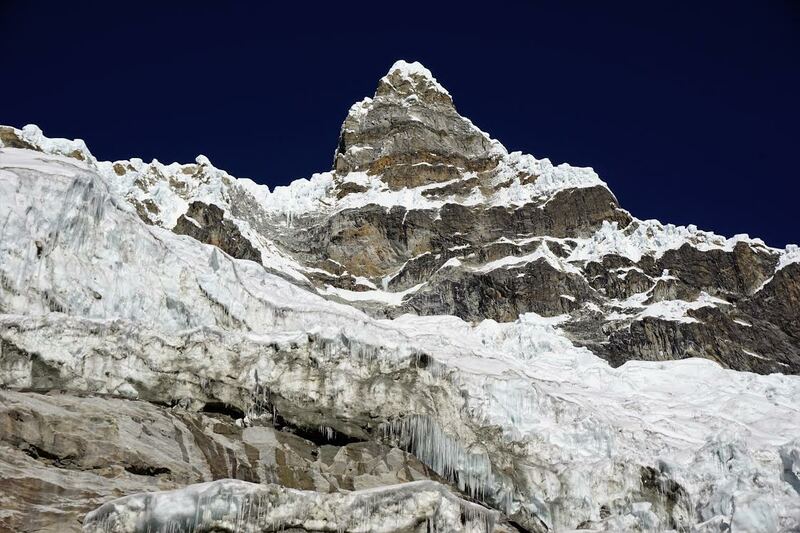 A French expedition led by Lionel Terray first climbed Chacraraju Este via the Northeast Ridge in 1956, less than a week after they made the first ascent of the higher, western summit known as Chacraraju Oeste (6112m) by the Northeast Face. The original route cut across the glacier to the ridge. We started on the south side of the glacier and we went straight up. The glacier was dramatically more flat back then. It's a different animal altogether now! 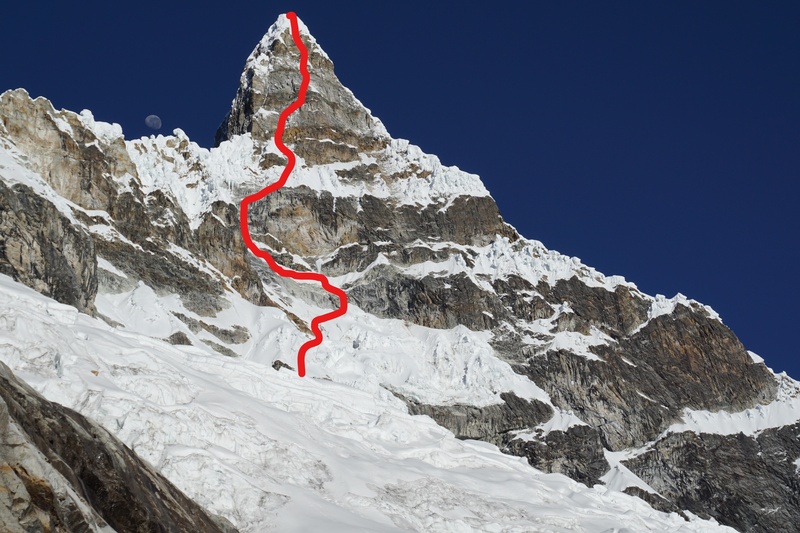 The first ascents of the east face (both Slovenian) climbed the obvious north-to-south ramp to start the face. Our route is completely independent from those lines. A British team climbed the SE ridge to the headwall. 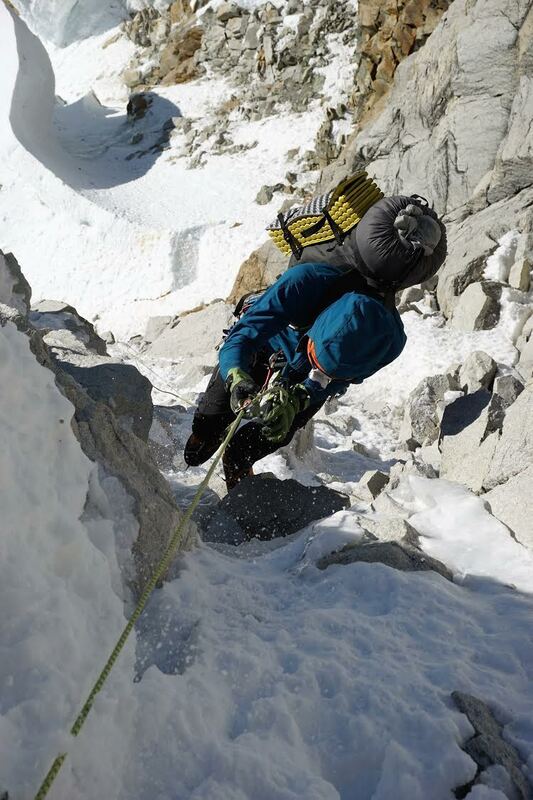 A Japanese team climbed the south face and fixed ropes on the SE ridge headwall. We saw their ropes up there. We climbed climber's right from their ropes, straight up the center of the headwall. It can be quite hard to find information. We looked into the big red book that's sitting in the guides' office in Huaraz. It has got all of the information on routes that have been completed in the Blanca and the Huayhuash since their respective guidebooks were released. It seems to be the most comprehensive source of information about ascents in the area. That said, all of the ascents that we found are documented online already. How did you end up setting your sights on Chacraraju Este? Roberts: Alik has had his eyes on Peru for a little while. His friends Steve Swenson and Jim Elzinga recommended that he go there. Alik messaged me about going, and I happily agreed. That was around six months ago. Since then we just spent some time looking at all of the options in the Cordillera Blanca and the Cordillera Huayhuash. We kept our route options open, because mountain conditions change so rapidly in Peru. Once we arrived and went exploring/acclimatizing we had a good idea of how much snow there was. It is a snowy season this year due to all of the rain that fell during the rainy season (hence all of the flooding that happened). This makes for good face climbing, but more heavily corniced ridge climbing. Last year was much drier (a New Zealand alpine team completed several new ridge ascents on Taulliraju). The face itself is pretty famous/notorious. It gets a full photo spread in the guidebook, and is on a lot of posters around Huaraz. Did the whole climb work out smoothly according to plan? Roberts: The climb has to be one of the smoothest we have both experienced. That was probably in part because we expected it to be very hard. It helps that the weather in Peru is always good at this time of year. It felt strange not being chased by scary weather systems.... We read the AAJ article about the rockfall and the cornice and it definitely gave us the willies. Also, of all of the efforts on the face, only one [Slovenian team] actually climbed the headwall. They...climbed two pitches of aid and they also took a fair amount of time to climb it. Even though it was years ago, that's still a scary warning sign. Given all of the information, and how imposing it was, climbing the face was certainly a daunting prospect. I think it is because we had that expectation that it seemed to go so smoothly. Now we have lightweight equipment. That made it easier, too! How long have you two been climbing together, and how would you describe your partnership? 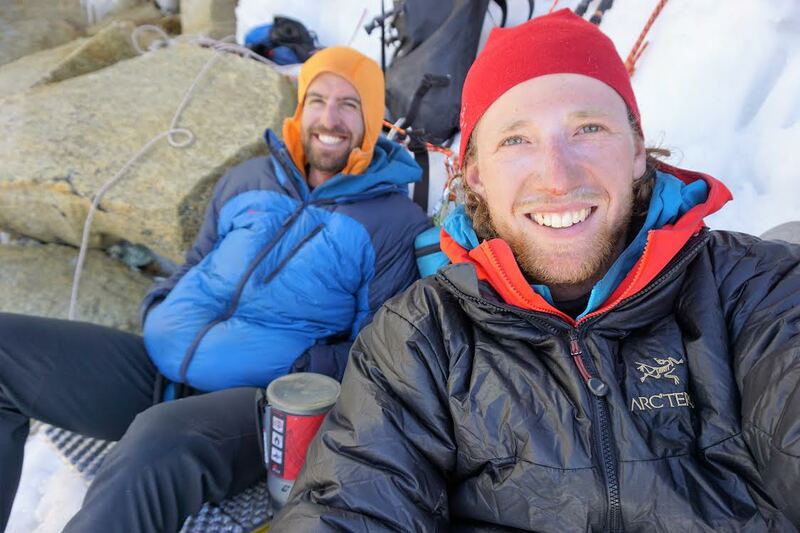 Roberts: We figured that we've been climbing together for around three years now—introduced in my one-room bachelor pad by our good friend Ian Strachan. We like Micro Traxions [mini ascenders/braking devices], and have definitely simulclimbed more terrain than we've pitched out. We play well off each other and seem to be good at having one person step up while the other suffers (useful at altitude). There's a solid community of winter/alpine climbers in the Canadian Rockies. The group is really tight knit. Most of us generally know each other or climb together. Berg: Quentin is a few years younger than me (he is 25 and I'm 29), and his enthusiasm and optimism balanced my slightly more cautious approach perfectly. It made for a great dynamic and carried us through more than a few times. When we started up the face at 10 p.m. I was feeling sick and not well rested, and it was amazing to watch Quentin push the rope up for six hours through the night while I struggled to keep up and keep my nausea under control! More details about the climb can be found on Roberts' blog here.